This book started its life on Wattpad and earned a place on the Amazon bestseller list. I wasn’t as impressed with it as I thought I would be, but it was an enjoyable three star read. 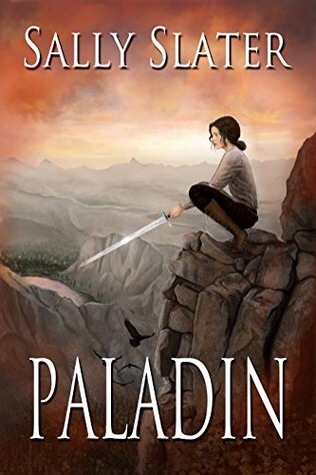 The well developed characters who populate the YA epic fantasy of Paladin are its biggest strength. They are dimensional, engaging, and often humorous. Sam’s narrative voice offers a believable strong female protagonist whom most readers will connect with from the start. I like the fact that she is a good swordswoman but she isn’t touted as “the one” who will save them all – she is just a trained girl who wants to fight the bad guys. The action is not too shabby either. The combat sequences offer a nice mix of detail and summary so that none of the fight scenes ever seem to drag on for too long. The magical system associated with the demons is easy for readers to grasp, and the half demon character of Braedon is put to good purpose when it comes to introducing the specifics that can’t be implied. World building is adequate and descriptions easily translate to mental landscapes for readers, but the author avoids bogging the story down with the influx of alien details that can often choke readers in this genre. While all of these factors should have added up to a pretty engaging read, it was a slow start for me, and it wasn’t until the second half of the book that I really found it compelling. I think the problem is that the structure of the book is similar to a quest story but the plot lacks a clear questing goal for the first half, focusing instead on character development that leads to the feeling of a somewhat pointless ramble through the countryside. This part of the story could have been more tightly plotted. I had a little trouble with the exuberance of the romantic relationship at the end, but I’m a sceptic of romance, so . . . Overall, I was pleased with this book and I think if you enjoy books like the Wheel of Time series this is a nice (much less convoluted and more YA friendly) book to consider. Enjoyable review. Thank you for sharing it with us.